C&H Solutions Western Mahjong with Combo Racks in Silver Hard case American Mah-jongg By by C&H Solutions at Saltarines Quito. Hurry! Limited time offer. Offer valid only while supplies last. 30 Days Unconditional Money Back Guarantee! Fast Shipping - in stock and ready to go !!!! *166 non-glaring tiles. Tile size (approx. ): 1.3x 0.9 x0.6. 30 Days Unconditional Money Back Guarantee! Fast Shipping - in stock and ready to go !!!! *166 non-glaring tiles. Tile size (approx. ): 1.3x 0.9 x0.6. - 36 Circles - 36 Bamboos - 36 Characters - 12 Dragons (Red Green and White) - 16 Winds (N, E, S, W) - 16 Flowers - 10 Jokers - 4 Blank Spares. *4 racks pushers combo, 1 Wind indicator and 3 dices. *1 case with 2 tile trays (With Lid). They will give your whole set the best protection for years to come. *An instruction manual that will help everybody to learn how to Play ! Silver (Black rim) hard exquisite elegant case protect Mahjong. 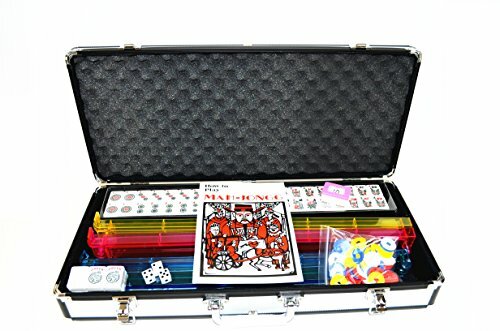 Complete American Mahjongg ,Western Mah Jong Set in the Blue Hard Case. Perfect Gift for Party , Birthday , Granguation .Christmas presend ! 30 days unconditional money back GUARANTEE. If you have any questions about this product by C&H Solutions, contact us by completing and submitting the form below. If you are looking for a specif part number, please include it with your message.